Two hours into my lessons, I was still scribbling as fast as I could to get down every last pearl of culinary wisdom gleaned from Chef Brigtsen. Paying it forward, here are some of his best tips and one of his fantastic recipes! Interesting back story: Gumbo comes from the African word “gombo,” meaning okra. According to Chef Brigtsen, okra was so valued in Africa that when slaves were shipped to the Americas, they hid okra seeds in their hair. Frank’s motto is, “In good cooking, color equals flavor and brown is the color of flavor.” He explained that roux passes through stages of color, from beige to caramel to peanut butter, finally reaching a dark chocolate fudge color which you’ll need for your gumbo. To speed up the roux-making process, you can pre-heat a cast iron skillet with oil to about 375 degrees, and then whisk in the flour. Another good time-saving tip is to can make a batch of roux (enough to last a few days) and set it aside at room temperature. The excess oil will rise to the top, which you can discard before using. “Too many people don’t give rice the respect it deserves,” Frank explained to us. The key to preparing perfect rice is the ratio of rice to liquid. Frank recommends local Jazzmen aromatic white rice. If you are making a seafood gumbo, Frank had another thrifty suggestion. After peeling the shrimp for the gumbo, cover the shrimp shells with cold water, bring to a boil and then simmer for 30 minutes. Drain and use the flavorful shrimp stock for cooking your rice. For perfect results every time, Frank uses two cups rice to 3.5 cups liquid, and cooks it for exactly 17 minutes. Since a meal without dessert is like a day without sunshine, Chef Brigtsen graciously shares one of his most popular desserts. 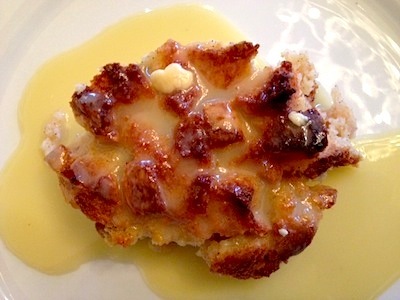 Chef’s Notes: Bread pudding is the most traditional of New Orleans desserts. As French bread is served at most New Orleans meals, there is almost always leftover bread that turns stale. This is the perfect way to utilize that stale bread. You may use this recipe as a base for many interesting variations by adding other ingredients such as pecans, bananas, dried fruits, chocolate chips, coconut, etc. In a pot, add the milk, 1 pound of white chocolate, and the split vanilla bean. Cook over low heat just until the chocolate is melted. Stir and scrape the pot occasionally with a rubber spatula. After the chocolate is melted, remove the vanilla bean and scrape the seeds from the pod and add the seeds back into the chocolate cream. Refrigerate until fully chilled. In a mixing bowl, add the eggs and whisk until frothy. Add the nutmeg, cinnamon and sugar. Whisk until well blended. Add the white chocolate cream and raisins. Whisk until well blended. Add the French bread to the custard and stir until the bread has absorbed most of the liquid. Pour the bread pudding into a shallow baking pan. Place the pan into a slightly larger pan and add about one inch of hot water to the larger pan to form a water bath. Bake uncovered at 350 degrees until the center of the pudding is no longer runny; about one hour. In a small pot, add the cream and 3/4 pound of white chocolate. Cook over low heat just until the chocolate is melted and smooth. Stir and scrape the pot occasionally with a rubber spatula. Serve the sauce warm. To serve, slice the bread pudding into 12 squares. Serve 3-4 tablespoons of warm sauce over each portion.